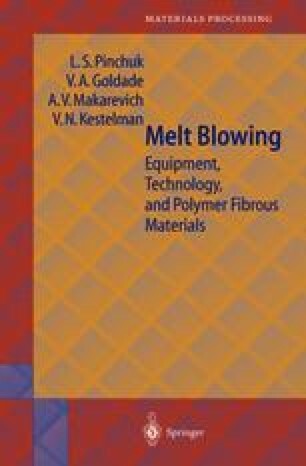 Melt blowing belongs, without doubt, to a newly developed industrial technique, though its onset dates back to the early 1950s. By that time, the world industry of chemical fibers already had at its disposal such highly productive and high-speed technologies as fiber formation from solutions and melts followed by linear extension [1, 2]. During the Cold War the U.S. administration showed an interest in producing of microfibrous polymer adsorbents intended for capturing radioactive particles in upper atmospheric layers which were signs of nuclear weapon tests intensively carried out in the U.S.S.R. during those years.